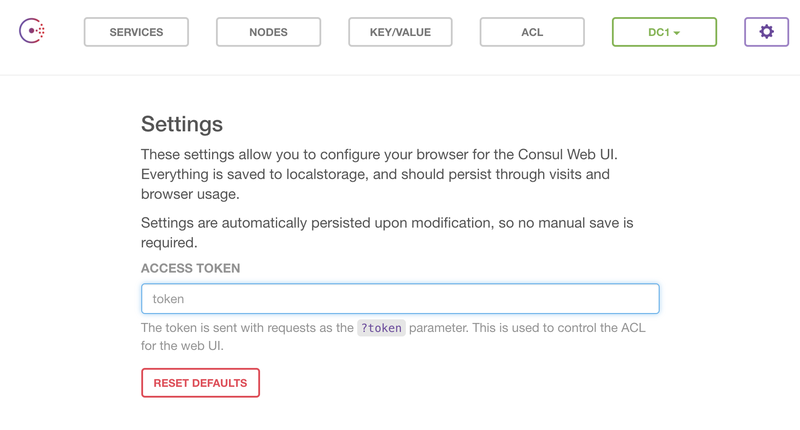 This is the 2nd post in securing Consul and this is about using ACLs in Consul. The first post (this one) we configured a Consul cluster by using gossip encryption and using SSL|TLS certificates. Now we cover the basics about Consul ACL’s (Access Control List) and configuring them in our cluster. We have to store/configure this file on all Consul Servers. You’ll see that we set the default policy to “deny”, so we block everything and only enable the things we want. When we have created the file, we have to restart all Consul Servers to make the ACL’s active. The anonymous token is used when you didn’t configure a Token in the settings page or didn’t supply it when using 3rd party software. You’ll only see the “consul” service, but won’t see anything else. If we would create a key in the key/value store, it will fail because the Anonymous token can’t do anything (Because of the property “acl_default_policy”:”deny”). The master token is the token we just filled in the settings tab and the one configured in the json file in the beginning of this blogpost and is sort of the root token. The one token to rule them all. Might be obvious that the “read” policy is for reading data, “write” policy is for reading and writing data and “deny” is for NOT reading or writing data to Consul. 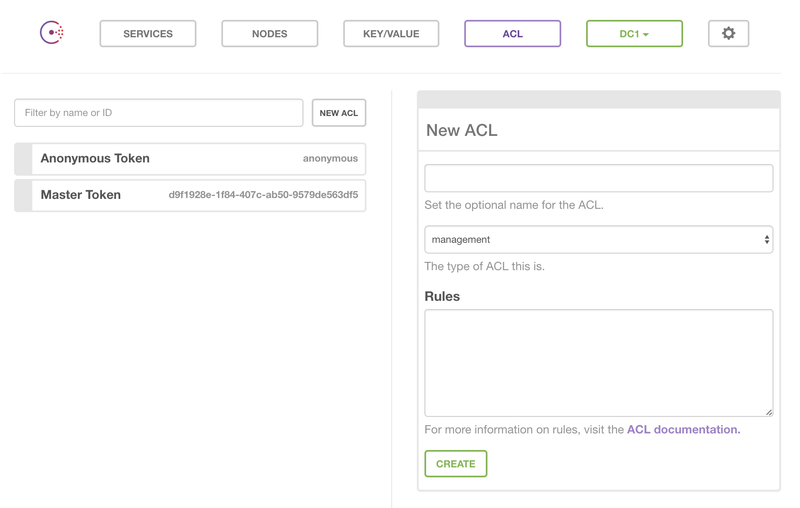 The ACL is written in the HCL language (HCL stands for HashiCorp Language) and we will create an ACL via the ui. You can also do that via the Consul API and automatically maintain them with for example Ansible, but that is out of the scope for this blogpost. In the ui we see on the right side of the page “New ACL”. When we click on “create”, the ACL will be created. With this ACL, we choose the type “client” instead of the “management” type. When you have selected “management” as ACL type, the users/services which will use this ACL can also create/update/delete this and other ACL’s in the cluster. As we don’t want that, we select the “client” type. We created 2 rules, both are for the key/value store. The first “key” rule specifies that all keys in the key/value store can be read with the ACL. With the 2nd “key” we specify that all keys in the “foo/” directory can be read and written. When we use this ACL, we can create the key “foo/bar”, but not the key “foobar”. Next for using “key” in the rules, you can also configure “service”, “event” and “query” rules. It has the same format as the “key” example above and uses the same policies. With this you can easily give each application (or user) the correct rights. With registrator we can easily add docker containers as services into Consul. Now we have configured a default ACL policy to “deny” we have to update our configuration for the registrator. Registrator will attempt to sent the data to Consul for creating the services and registrator will think this is done, but Consul will deny because of the default policy. We can create a ACL specific to registrator. Both have their pros and cons. With the first rule we allow that registrator can add all services into Consul and requires not much “maintenance”, it is a little bit to “open”. The 2nd rule requires more maintenance by adding all services but is more secure. With this, not all containers are added automatically and thus no rogue containers will be available in Consul. We had to add the -e CONSUL_HTTP_TOKEN variable with the token id as value. When I start the “kibana” container it will be added to Consul and we see the service is created. We covered the basics for creating and using ACL’s in Consul. Using ACL’s in Consul will help securing Consul more by only allowing settings that is needed for the container purpose. Hopefully this will help you configuring ACLs in your environment.